SSC MTS Multi Tasking Staff Recruitment Exam Results to be Declared on 15 January 2018 at SSC.NIC.IN. SSC MTS Multi Tasking Staff Recruitment Exam Results 2017/ SSC Multi Tasking(Non-Technical) Staff Recruitment Exam Results, Admit cards 2017, Last date for apply online: 20.01.2017. Online application form, exam date, Examination Scheme, admit cards, results and more details to be available on www.ssc.nic.in. Government of India, Department of Personnel & Training, Staff Selection Commission, Multi tasking (Non technical) Staff in Different States and Union Territories Examination 2016. Staff Selection Commission will hold the Multi Tasking (Non Technical) Staff in Different States and Union Territories Examination, 2016 in OMR based mode for recruitment to the posts of Multi Tasking Staff in different Ministries/Departments of Government of India and their Attached & Subordinate Offices on 16.04.2017, 30.04.2017 and 07.05.2017. These dates are tentative. The Staff Selection Commission (SSC) has published the results of Multi Tasking Non-Technical Staff (MTS) Recruitment Exam 2016 on the official website: ssc.nic.in. Note: All the candidates are advised to take print out of the same for future use. The examination (OMR based) held in May was cancelled by the Commission. It was cancelled after the question paper and the answer keys were readily available on social media. The written examination consisted of the following Paper 1 and Paper 2. Paper 1 (Objective type paper): The exam was based on general intelligence and reasoning, numerical aptitude, general English and general awareness. The exam carried a total of 150 marks and was held for a duration of two hours for general candidates and two hours and 40 minutes for visually handicapped/cerebral palsy candidates. Paper 2 (Descriptive paper): This part was descriptive in which the candidates were required to write short/essay/letter in English or any language included in the 8th schedule of the Constitution. This exam was conducted for the candidates who meet the cut-off prescribed by the commission in Paper 1 for different categories. The candidates will be shortlisted on the basis of their performance in Paper 1. Paper 2 will be only of qualifying nature. The cut-offs in Paper-I and qualifying marks in Paper-II may be different for vacancies in each State/UT will be fixed at the discretion of the commission. Candidates for each State/UT will be finally selected based on their performance in Paper-I, subject to their meeting basic qualifying standards fixed in Paper-II. SSC MTS 2016 Paper-I Results to be Declared on 15th January 2018 at ssc.nic.in: SSC MTS 2016 Paper-I Results are tentatively scheduled to be released by the Staff Selection Commission (SSC) on 15th January 2018. As per the status report of SSC Exam Results published by the Staff Service Commission on its official website, the Multi-Tasking Staff (Non-Technical) Examination, 2016 (Paper-I) results will be declared on 15.01.2018. Multi Tasking Staff or MTS paper is conducted by the Staff Selection Commission to recruit candidates for junior staff posts in various central government departments. The Computer Based Test for recruitment of non-technical Multi Tasking Staff was organized across the country in the months of September and October 2017. Candidates who had appeared for the same must keep a tab on the official website of SSC to check their status. SSC had conducted the Re-Examination for MTS 2016 Paper-I exam on 16th September 2017 and 26th October 2017, for which it had released the provisional answer keys in November last month. Staff Selection Commission (SSC) has released the Multi Tasking Staff (Non-Technical) Re-examination, 2016 tentative answer keys on the official website of the commission. The SSC MTS answer key 2017 can be accessed from the official website, ssc.nic.in. The Computer Based Examination in respect of the SSC MTS (Non-Technical) was held from September 16, 2017 to October 31, 2017 at different centres all over the country. SSC had in May this year cancelled the OMR based examination conducted for the recruitment of MTS (Non-Technical), 2016 along with the then scheduled ones and has re-scheduled dates to September-October year. The candidates' response sheet along with the tentative answer keys of SSC MTS 2017 are now available on a link given on the official website. Step 2: Click on the SSC MTS Answer key link: "Multi Tasking Staff (Non-Technical) Re-examination, 2016-Uploading of Tentative Answer Keys"
Step 3: Click on the link given there on the next page open: "Link for candidates' response sheet, tentative answer keys and submission of representation"
Step 4: The candidates may log-in using the same 'ID' and 'Password', which were used by them during the Examination, to download the same. The candidates may raise their objections or representations in respect of the tentative answer keys, if any, and can be submitted on line from November 20, 2017 (7.00 PM) to November 26, 2017 (5.00 PM) on payment of Rs. 100/- per question/answer challenged. Representations received after 5.00 PM on November 26, 2017 will not be entertained under any circumstances, said an SSC notification regarding SSC MTS Answer key. SSC Multi Tasking Staff (Non-Technical) Re-examination, 2016– Uploading of Tentative Answer Keys: The Computer Based Examination in respect of the Multi Tasking Staff (Non-Technical) was held from 16-9-2017 to 31-10-2017 at different centres all over the country. The candidates’ response sheet along with the tentative answer keys are now available on the link given below. The candidates may log-in using the same ‘ID’ and ‘Password’, which were used by them during the Examination, to download the same. Representations in respect of the tentative answer keys, if any, may be submitted on line from 20-11-2017 (7.00 PM) to 26-11-2017 (5.00 PM) on payment of Rs. 100/- per question/answer challenged. Representations received after 5.00 PM on 26-11-2017 will not be entertained under any circumstances. 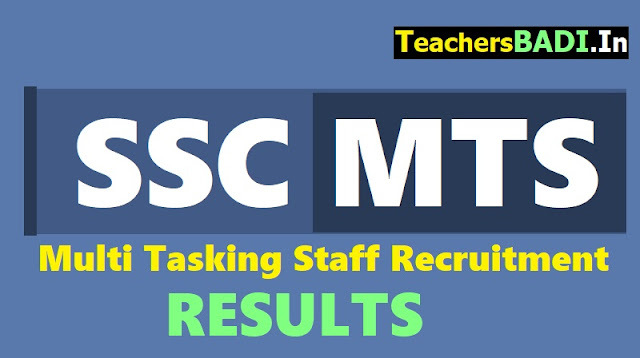 The Staff Selection Commission (SSC) on Monday issued the tentative answer key of Paper 1 of Multi Tasking (Non-Technical) Staff (MTS) re-examination, 2016. Candidates can check the answer key and raise objections until 5pm on November 26, 2017 on payment of Rs. 100 per question/answer challenged. Staff Selection Commission (SSC) has issued notification to conduct Multi Tasking (Non-Technical) Staff Exam 2016 for the recruitment of 8300 Multi Tasking (Non Technical) Staff vacancies. Qualification: Minimum Essential Qualification prescribed for the Examination is Matric pass or equivalent Examination passed from a recognized Board or a University. Age Limit: Between 18 to 25 years as on 01.08.2017. For Age -limit, Reservation, Age-relaxation, Examination Scheme and other details, please refer to detailed Notice of Examination to be published on the Commission's website (www.ssc.nic.in) on 24.12.2016. How to apply: Candidates may apply online through SSC website. The facility of filing online. application and payment of fee, through State Bank of India (SBI) will be available. Last date to apply online: 30.01.2017. Date of Examination: 16.04.2017, 30.04.2017 & 07.05.2017.